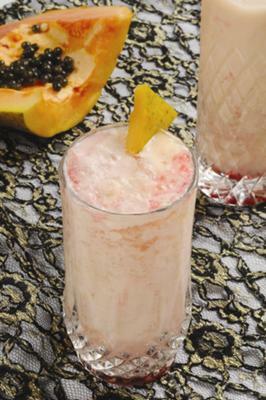 This Papaya Honey Smoothie recipe, a fruity drink with the goodness of ripe papaya & honey. It is a very easy smoothie recipe and you can make it within minutes. You know papaya provides you with vitamin A. It is available easily the whole year. Papaya is easy to digest and is helpful in giving relief from heartburn and eliminating constipation. You may eat a ripe papaya as it is. But when you make it into an interesting drink, the enjoyment is increased. How to make Papaya Honey Smoothie? Put papaya and milk in a blender and blend till smooth. Add all the remaining ingredients and blend until thick and frothy. I told you that this papaya smoothie recipe takes only a few minutes. My family loves it. I am sure your family will love it too. This is a wonderful drink for these hot summer days. It looks great too. I made it and enjoyed it with my family. Your papaya and honey smoothie looks sooooooo tempting. I tried it and it tastes wonderful too.